Buried treasure in Virginia has been located by others. And there are still lots of areas that contain caches of all kinds. I have listed a few stories below. However, before you start your search there are a few things you should do that will make the possibility of finding one of these treasures easier. You need certain tools, both physical and mental. 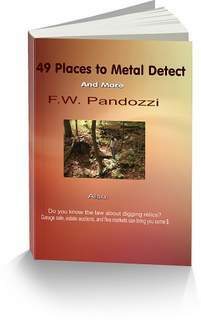 Have a metal detector, they make searching much easier, and do some solid research of the area you would like to search. Metal detectors have made treasure hunting much easier. Years ago the old timers searching for hidden loot, used pick axes and shovels only after they guessed where a cache may be buried. In today’s modern world of treasure hunting the advent of the metal detector has made the adventure much more interesting, and in many instances, rewarding. If you do not own a metal detector, but you are thinking of purchasing one, do not spend a lot of money. A good, reliable detector can be purchased for approximately $250. There are many different kinds on the market. I’ve used just about every make in forty years of metal detecting/treasure hunting, and personally, I always come back to the Garrett family of detectors. If you are interested visit my Garrett page here. The stories I give you below should not be the only source of information you use when you begin searching for any of these buried treasures in Virginia. This information has been handed down for many years. And as treasure stories go, many have been changed either by accident as they are told or re-wrote, or changed intentionally to throw the would be treasure off their search. The more information you have, the better your chances of locating any treasure. You should read history books, and visit libraries, and State Historical societies. And ask questions, lots of them. You need to be like a detective searching for information on a criminal case. Visit my research page for more information. Here are five areas in Virginia that have stories about treasures. The Shenandoah Caverns may hold large amounts of raw gold and items of worth stolen from raids on white settlements in and around that area. The caverns are located approximately five miles north of New Market, on rte 11, in Shenandoah County. The Bureau of Engraving Treasure is a cache consisting of approximately $31,000 in new paper currency, along with a set of twenty-dollar bill printing plates concealed in a leather pouch. They were supposedly cached near a creek bed just north of Warren, located on rte 11, in Fauquier County. The Captain John Mosbey Treasure is a buried treasure in Virginia worth 2 million dollars. Mosbey, a confederate guerilla, supposedly buried the cache between two large pine trees between Culpeper and Norman, near County rte 522, in Culpeper county. The treasure is said to be tons of gold and silver objects. Hog Island Bay may hold pirate treasure. Cape Henry has produced many coins and relics. In the early 1700’s a fleet of 24 British ships carrying hundreds of thousands of pieces of eight, and gold coins, along with cargo crashed onto the shores. It is important that you always ask for permission when entering private property. If you are going on to State or Federal Land, in search for lost treasure, be sure to check with your State laws about any digging. Here is the original federal law about digging artifacts. Buried treasure in Virginia may exist in ghost towns. Good Luck with your search for buried treasure in Virginia.